A New Dark Knight rises on the CW. Entertainment Weekly has revealed our first “actual” look at Ruby Rose in action as Batwoman—“actual” in that, instead of a heavily overlit photoshoot look at the CW’s take on the Batwoman costume, it’s a real still from the upcoming three-episode crossover between The Flash, Arrow, and Supergirl. It continues to look great! I’m very excited to see it in motion. But it’s still the same Bat-costume we’ve seen already, just in different Bat-lighting. She is more fun because she’s a billionaire, she has ladies that love her. I think, for the most part crossover-wise, she’s swaggy. She always knew who she was, but she’s really coming into knowing who she is in the crossover, and with Batwoman as well. It’s not the first time she’s put on the suit. Kate does not want to deal with this. She has a whole other agenda, a whole other life that she’s trying to sort out right now, and these frigging superheroes come in and they’re a mess, and they need her help. 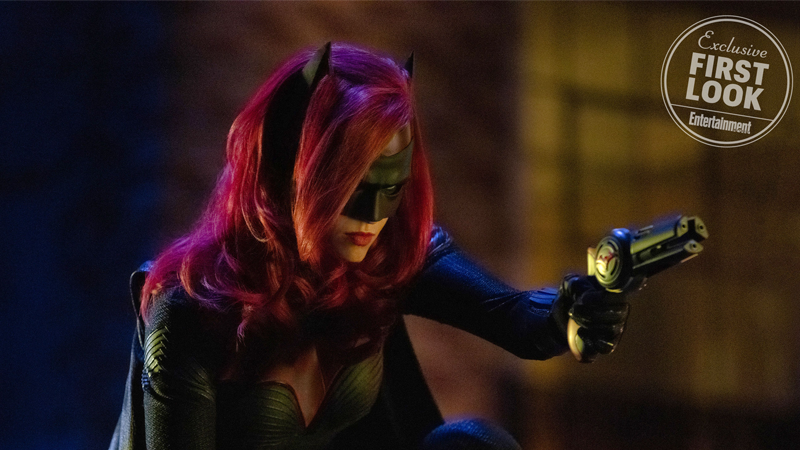 Given that Oliver Queen usually fulfills the grump factor in CW/DC Crossovers, it’s honestly going to be kind of fun to not only see him get looser with the shenanigans, but to have Batwoman as a grump-filter instead. Now that they actually have a Bat-family member, maybe Ollie can stop aping the Dark Knight so much! Elseworlds kicks off three nights of Batusi-induced mania starting December 9. Nana Nana Nana Nana Bat-Woman!